Its’ fall which means it is finally pumpkin time! We all know how to carve a pumpkin for a Jack-o-lantern. 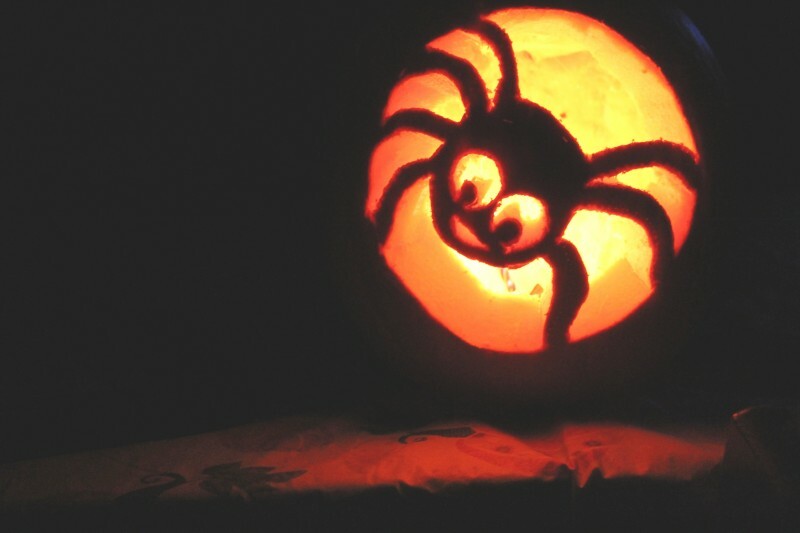 And many times, people use the small pumpkins to decorate around the house. 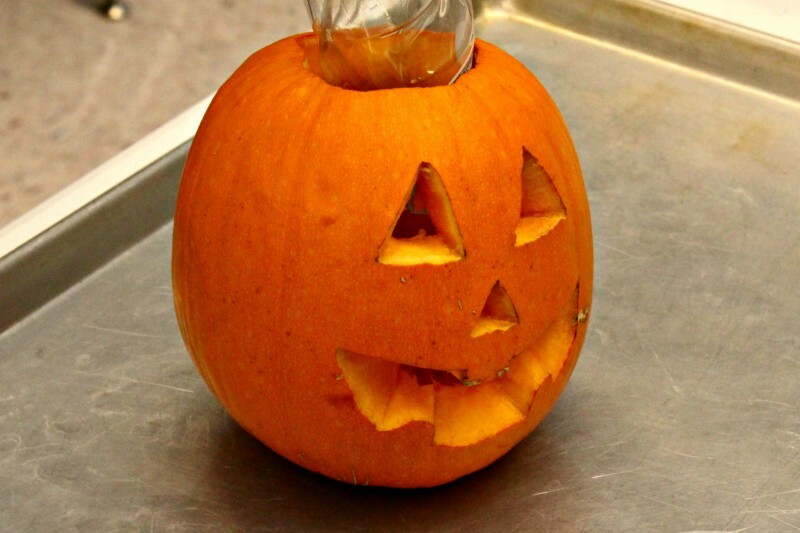 But do you know of any other fun ideas to use pumpkins for? Making learning fun is the best way to keep kids motivated and interested. And Science experiments is a great way to give kids some hands on learning fun. My kids really enjoy projects that they can take part in. Not only that, but they tend to remember those learning experiences much more than ones they just read in a book. So if you’re wondering what to do with all those pumpkins you grew or bought from the store. I’ve got a fun learning activity! (You’ll want to use pumpkins that are about 8 inches tall or shorter.) Sit the kids down and carve a variety of designs on them. And something I wish we would have also done was leave one of the pumpkins with just the top cut off and the insides cleaned out. No design on it. As that way, we could have done a side-by-side comparison of results. 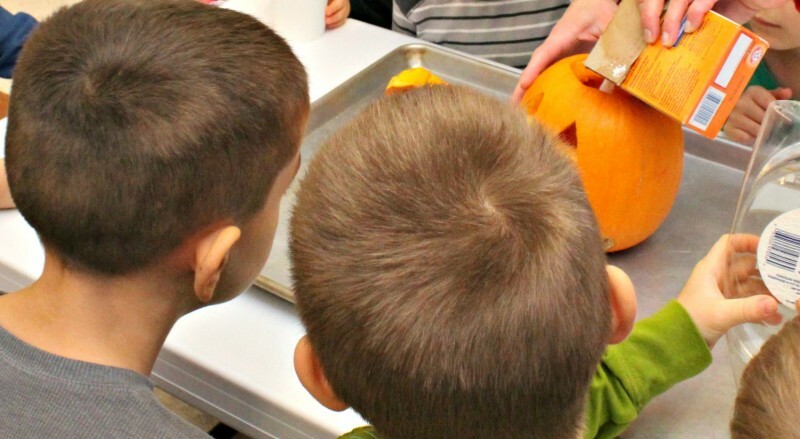 First begin by lining up your pumpkins that you want to use for this experiment on a large cookie sheet. (You’ll want it to have as deep of sides as possible.) Next you’ll want to add a couple drops of Dawn dish soap and food coloring, any color you’d like. Then, pour in a few tablespoons of baking soda. Now you want to take a few minutes and ask the kids some questions. Ask if they have a hypothesis on what will happen if you add vinegar. Or what would happen if you add water. And then comes the exciting part! Slowly start pouring in some vinegar. 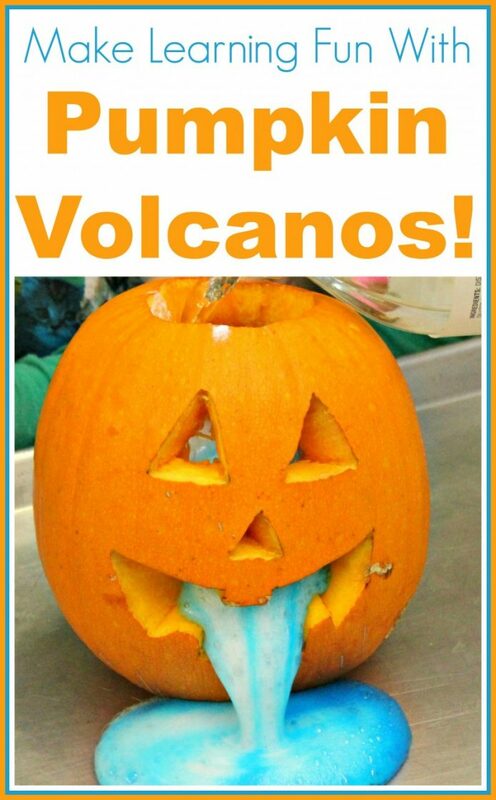 Watch as your pumpkin volcano erupts! 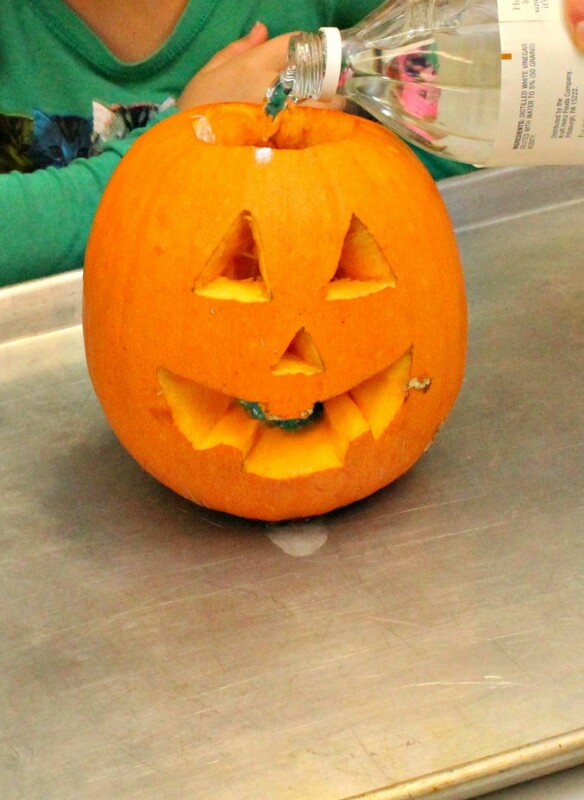 We found that it didn’t matter how much baking soda and vinegar we used, we were unable to have it erupt out of the top with a face carved in. So that’s why it would be super interesting for the kids to see the difference on a carved pumpkin versus one without a design. During the guessing/hypothesis time, you could ask questions about which one they think will erupt out of the top and why! We love making learning fun! So tell me. What ways do you incorporate learning in your daily life, activities, and experiences? 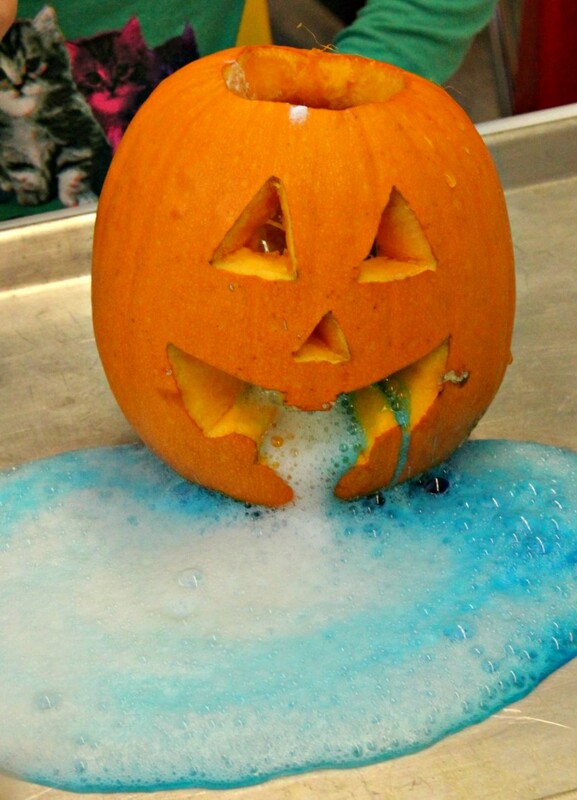 What a fantastic idea and great way to use those pumpkins! My kids would have so much fun doing this experiment and watching. 🙂 Thank you so much for sharing, we will definitely be doing this! Ha! This is so cool! I would try besides uncarved, smaller and larger pumpkins. I wonder if you had a small one and it was carved or uncarved would it come out of the top? I bet it would! This is a really cute idea. I love projects that are not only educational but also fun! That project is a hoot! I love science. Oh, how much fun that is. I want to do that too. The kids will love it. Thank you for sharing.